We have seen a few small CNC routers in the past, the CNC Shark that Rockler sells, and the DIY build kits, but the Torchmate 2x2 CNC machine has a unique feature that sets it apart. 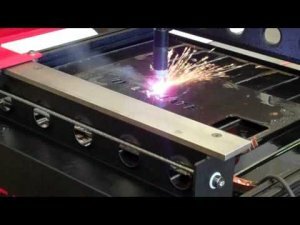 The Torchmate 2x2 is the first CNC that I have seen that can do both CNC routing and CNC plasma cutting on the same machine. Torchmate likes to call it a prototyping machine, and because of its small size and its multiple functions, I would have to agree. Hobbyists, woodworkers, fabricators and small shop owners can now build intricate and professional-quality parts using the versatile 2X2. Sold with versatile software, and compatible with multiple tools, the 2X2's functions are repeatable, precise and fast. The 2X2 cuts, drills, engraves and can be used as a router and plasma cutter. The basic 2 axis Torchmate costs just under $3000 and you have to provide your own plasma cutter and build your own stand, or you can purchase their water table for $750. If you want to do CNC routing, you will need to spend an extra $770 to get the third Z-axis and this comes with a Bosch Colt 1HP router. This would be a pretty big investment for anyone interested, but the online reviews look good. If you want to see what it can do, check out the video below. This is a video of testing the ESAB Powercut 900 on a Torchmate 2x2 CNC Plasma Cutting Machine with 2x2 Water Table. In this video we are cutting 10 gauge mild steel with the plasma cutter running at 40amps and 130 inches per minute. For more information go to http://www.torchmate.com.